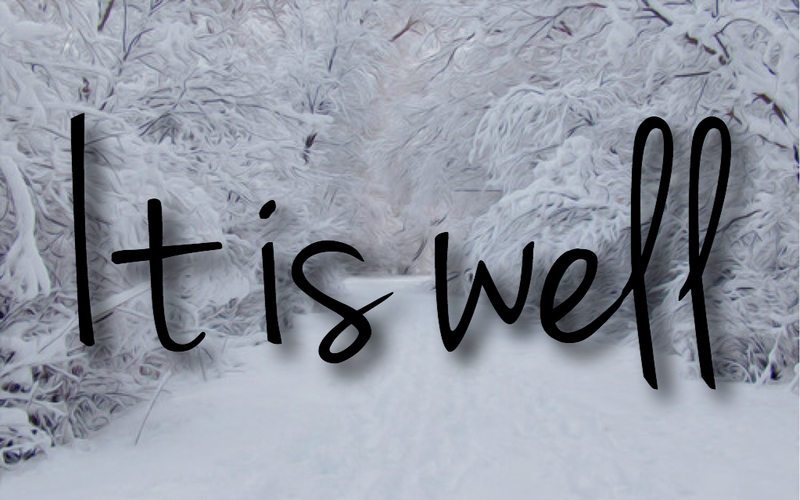 I never really understood why people, particularly in the Christian circle always used the statement “it is well” when things were evidently ‘not well’ or had not quite gone to plan. However, I now know that constantly telling myself that everything is going to be alright and through it all – it is well, is one of the strongest mindsets that can help pull you through some of life’s tough challenges. Nearing the end of February my Mum-in-love (to me: Mum) passed to glory. I don’t think anything quite prepares you for the lesson of having to let go and trust God when nothing seems to make sense. What followed seemed like a bad dream, like it wasn’t really happening and we would suddenly wake up to a reality contrary to what we were currently being told. Trying to process what I had just heard, thoughts began to flash through my mind. “How can any of this be real?... Surely there is some sort of mistake?... What is Moe thinking right now?... Should I turn to look at his face?... Should I hold him?... Hold on! We’ve prayed about this situation and we trust God’s word is true and will not fail!... She’s been through worse in her life and has come through just fine!... How are we going to cope without her?... How can this be happening to us at a time like this?... Maybe this is just a test of our faith to see how we will react?”. Question upon question upon question. Things very quickly went from 0-60 in just a few days and there was so little time to actually process everything that was unfolding right before us and those few days proved to be the most challenging any of us had ever faced. There were mixed emotions, as we still tried to hold on to God’s promises that the situation would turn around for the better. There were moments of pure silence, because none of us knew what else to say or pray. Moments of noise and conflict because naturally, we were all trying to deal with the situation in our own individual ways. There were times when we simply could not eat because our appetites had gone out the window and nothing tasted good. I personally no longer felt the drive to do anything, be it business, taking care of the home, YouTube, blogging, ministry, nothing. Because my mind was on one thing only and although Mum had said we must carry on, I could not even bring myself to simply interact with people. Most of the time I just wanted to be left alone and I did not want to begin to imagine how my husband was feeling. I don’t think anything can truly prepare one for the passing of a loved one, but we are pressing on and as the seasons begin to change from winter to spring, we hope for newness of life as we heal. It is at times like this that everything is brought into perspective and just like the constant snow that fell on the week she passed, we realise just how fragile and precious life is, here today gone tomorrow. So we must really make the most of every moment we spend with our loved ones and not take anything for granted. Kristene DiMarco’s song “It is well” [Click here to listen], has now come alive and has ministered to us in a way that it never really had before. Every single word brought about a reassurance of God’s peace and that His will is best, something we needed to be reminded of at this time. Through it all, we cannot deny how faithful God has been to us and we are grateful that He was not silent. When we had specific questions, He answered them, be it in the form of a text message, a scripture, a word, a conversation, a hug, even through nature around us, He was speaking and is continuing to speak. We are grateful that we got to spend time with her and glean wisdom from her as she instructed us before her passing; words that we will always treasure and hold dear to us. We are grateful that her transition to Heaven was glorious and we can rest assured that she is in a better place where there is no more pain or suffering. We are grateful for the beautiful legacy of resilience, hard-work and kindness that she has left; attributes that we will strive to instil into her grandchildren. We are grateful that this is not good-bye because we know we will meet again. As I conclude, though the pain of not being able to see her anymore still stings, even though we may not fully understand everything, we do know that life must go on and through it all and with God with us, ‘It is well’.